Spring is in the air in California, so here is a little inspiration to kick off spring cleaning with simple and stylish jewelry storage solutions. From tea cups to cupcake pans to shadow boxes, there are an abundance of creative and inexpensive ways to display your baubles. how crazy, I have been looking at jewelry and makeup collection ideas for a whole week already! everything is getting so tangled and ruined, so i definitely want to get wall hooks or the jewelry tree! these are some great ideas, keeping them in mind! I love love the use of the cute little bowls. I love the tea cup idea! Gorgeous. Love these ideas! Always looking for creative ways to organize my ridiculous and growing collection of jewelry! Such clever jewelry storage ideas! this is an amazing idea for a post, absolutely love it! Soo cute. Love the muffin tins! So cute! 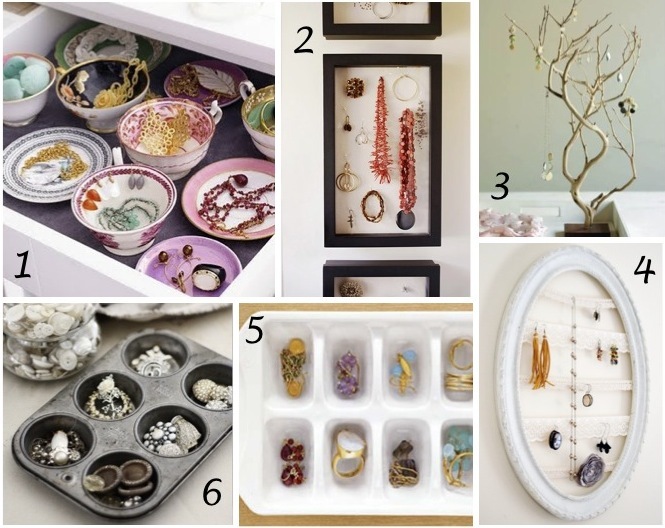 I am a totally jewelry fanatic, I love all of these storage ideas! Your blog is so cute! I love the name "a bit of sass". I write a personal style blog http://sidesmilestyle.blogspot.com/ Feel free to check it out sometime! Haha love the cupcake tins!unfortunately it would not hold my jewelry/junk collection (not meaning my jewelry is junk, but I also have a lot of old crap that I just can't throw away). I bought a nice system in Ikea with two shelves in your closet, really handy! Great post. I love the muffin pan idea - how cute & clever! Holiday Gift Guide: Cool Tech Gifts for Men!